I did not grow up with pets, but in my early twenties adopted a kitten and fell for her hard: furry little Sabine herself, but also the wonder of living in close quarters with an animal. I loved pondering that mysterious life story carrying on parallel to mine. While I was going about my business—making dinner, trying to shake off the day’s work, returning a call to Mom—Sabine’s “business” took her purposefully from room to room in the basement apartment I shared with a friend, over and under furniture, onto the TV, up to the windowsill. She was following a daily plot, the details and meaning of which were apparent only to her. I was struck by this life that was as rich and varied and agitated as my own, yet devoid of the concerns that I sometimes felt would consume me. Of course, Sabine didn’t exist in order that I could gain perspective, nor to curl up with me on the couch while I watched “Seinfeld.” The more I enjoyed puzzling over her nature, the more I wondered about the whole idea of pet ownership. For starters, isn’t “own” a strange term to apply to our relationship with another living creature? 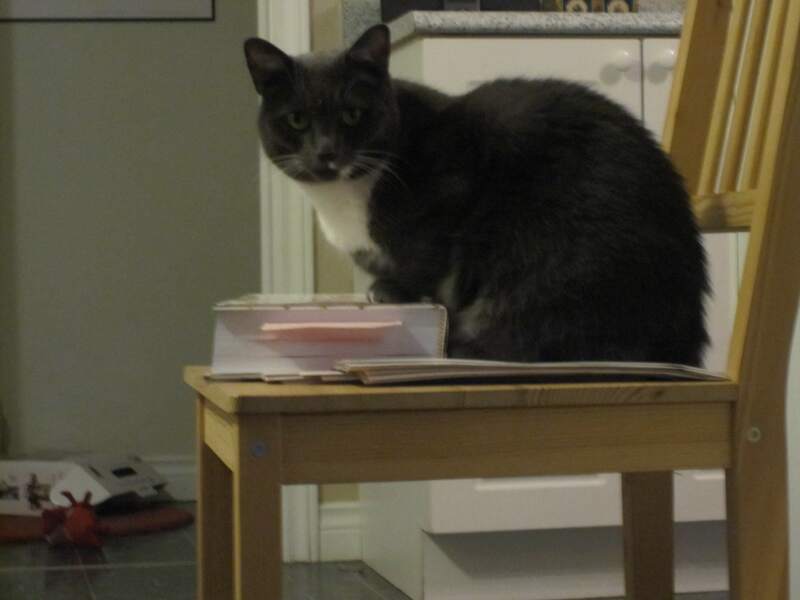 When she was a few years old, Sabine went to live with my mother, and I came to acquire—there it is again, that odd vocabulary—a deaf kitten named Professor McGonnagall, who’d been rescued from an Ottawa back alley by some friends. 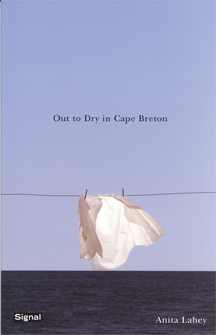 Dr. M., as another old friend came to call her—he also once gave me a tin sign that said, in her honour, “chat lunatique”—was incurably drawn to the outdoors, but I (and my partner at the time) had been foresworn to keep her housebound: her deafness was a grave liability in the urban wild. We mostly kept the promise. Dr. M. occasionally slipped past our guard, and would invariably find herself in a tense situation with other neighbourhood cats, at times even surrounded by them, howling pitifully. Eventually, by the time she and I were living on our own, even a few moments on the back fire escape of my Montreal apartment would result in her tail puffing up like a ball of static. To approach her elicited growls and hissing. She could only be brought indoors after being coaxed into her carrier. My former alley cat—the toughness that implies!—could no longer wander beyond her own balcony without going berserk with fear. I had kept her safe, I’d spared her the grim life of a stray, but at what cost to her nature, to her essential catness? I do know conventional wisdom says domestic felines are better off as housecats. (The American Humane Association outlines all the reasons for this here.) But I can’t get past the absurdity of keeping a sentient being between four walls for its entire life. No soil, no sky, no leaves, no breeze. Like cats, people get hit by cars, get into fights, pick up diseases on their travels. Like cats, people also cause all sorts of trouble for other fauna, as well as flora, when they sally forth. All things being equal—if there were some constant source of food at our disposal, say, and heat and clothing—would we consider keeping humans indoors because it’s safer all around? Yeah, it’s a dumb question. Totally beyond rhetorical. Still, it follows me around. I picked up this rich and troubling anthology again recently after reading The Zookeeper’s Wife: A War Story, a work of nonfiction by the top-notch storyteller Diane Ackerman, about the Zabinskis, the couple who were running the Warsaw Zoo when WWII broke out. In a meticulously researched tale that has you in its hold even before the narrative embarks on the real horrors that took place, Ackerman tells us what happened to the couple, the animals that were in their care, some historical background on zoos and particular species, and all about the inner workings of the underground resistance in which the Zabinskis became central players, hiding dozens from the Nazis in their decommissioned zoo throughout the war. When you read of a zookeeper such as this, and about the vibrant and undeniable relationships that emerge between Antonina and the animals in her care, it is difficult to simplify your feelings about zoos. It jars something in us to see animals in cages, in many cases continents and oceans away from their natural habitats. When my thoughts stray this way I am reminded of the protagonist in Yann Martel’s novel, Life of Pi, who argues that widespread contemporary ambivalence regarding zoos stems from an “illusion” people have about freedom. We romanticize wildlife, Pi contends, ignoring the violence and hardship of a truly wild existence: he tells us animals are, in fact, content with and even grateful for the routine and safety offered by zoo life. Martel’s hero makes a compelling case. The problem is that we don’t know he’s right—in our guts, I mean—and we can’t buy that even the keeper truly knows. We can observe the animals’ behaviour, monitor their health, and thus conjecture. But peer into an animal’s inscrutable eyes and—much as when you stare into a baby’s—you can only wonder. What is behind them? What do they see? The animals in the Adelaide Zoo are very comfortable. It’s a small zoo but very well organized. The elephant stands in a small space but seems happy. The Animals in the Adelaide Zoo are already in Heaven. Their children are born lucky, nobody hates them. They are surrounded by love and regular food. Their lives are without drama, they show no fear. The tight stanzas just barely keep a lid on the writer’s internal scream: Set them free! Indeed, so many of the poems in the collection stem from this angst it becomes frustrating. You begin to ask more of these poets who span continents and ages, to wish a larger proportion of them could—as Conn does, in entering the tiger’s cage—move past this familiar “free Willy” instinct. To, say, the darker place—or might it be lighter?—that made us lock the animals up in the first place. For even as we project our horror of confinement onto these animals, we are drawn. Like us, they live and breathe and eat and move. We want to know them and relate to them. We find justification for zoos in the idea that they raise awareness about the natural world; that nowadays they are sometimes the last resort for endangered species. (I still don’t know what our justification is for keeping pets—though I am seeking another!) But we also know that the zoo is the only place most of us will see a tiger in our lives, likewise a polar bear, giraffe, or two-toed sloth. And we want to look. We’ll look with our mouths wide open, fingers hooked through the fence. And then we’ll blink, and look again. In The New Quarterly’s winter 2013 issue (number 125), the poet Jeffery Donaldson has contributed a wonderful, insightful essay called “I Stand Before You: Museums, Galleries and How to Find Yourself in Them.” He is not talking about the zoo, but he is talking about looking, and he does veer into the biology department: to things preserved in bottles. 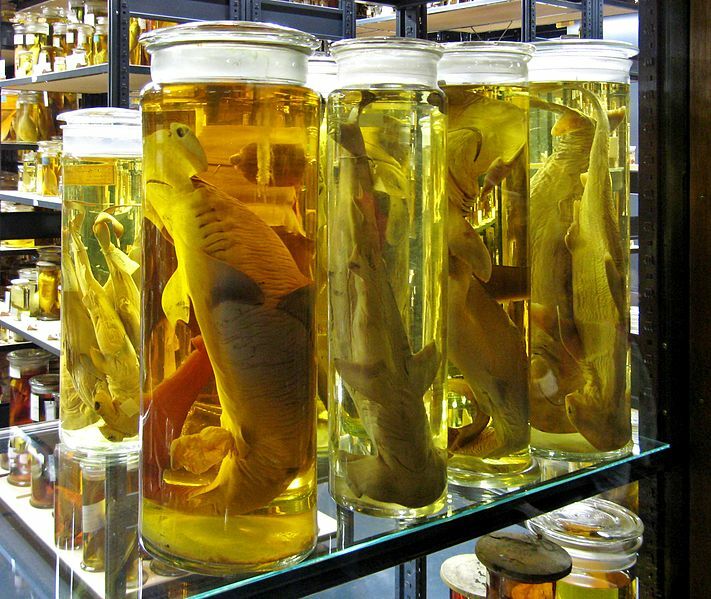 Donaldson writes, “Such a frisson I feel peering into these small bottles and alembics, their quiet, tea-green oases, vessels of magnified clarity, at once both heavy and fluid.” I think of the wall of bottled eels, crustaceans and other squiggly, floating creatures at the ROM, which holds me for lengthy, wide-eyed moments during which all I can do is wonder blankly at what I’m seeing. It’s partly the way light is caught in the glass and in the jars’ buoyant contents: it’s as if the light itself has liquefied, transformed to a golden syrup. And that magical fluid has become a resting place, and all the bottled organisms are sleeping beauties plucked from the sea. I don’t want to say that creatures in the zoo are “ambiguously alive,” but there is definitely something ambiguous about the nature of their existence that both troubles and lures us. These animals are specimens of their kind, and are—if all goes well—perpetuated and “preserved” in this place, even in the event that their wild brethren die off. But preserved to what end? Purely for our own enjoyment? puts his face to the chimpanzee’s glass. and look how the mother presses the young one close. if the earth were made of glass. Though awfully sad, it’s not unexpected to imagine a destitute man longing for the comforts inside the cage—but Bolster renders this longing so plainly and honestly that its very inevitability gives it power. I have been seeing this fellow in my mind on and off for the past few weeks, staring in at the warm world of the chimps, the bright oranges standing out against the hay, the snuggling mother-and-baby emphasizing his own shortage of homey human contact. And then the poem turns, and turns again. First the whole city gripped by the neck like an errant cub. And then the rolling pearls become the glistening cars of the metro, a racing stream of shiny cages, offering a view that could be the man’s, if only things were different: his situation, his perspective, the make-up of the earth itself. And what would he think, peering down at his own glassed-in kind? What would he at last understand? In “Song for the Song of the Aviary,” Bolster puts all her effort into recording the birds’ artificial environment: the echoes “as in a can”, “plastic tassels”, “mesh sky”, “fish in dishes, paste smeared in a tray”, “shallow basin, mini hills”. The question at the heart of the poem: Is this enough? “Maybe they’re happy” she writes. And: “The air is real, rainy at times/ to wash it cleanish.” I think “cleanish” calls up a feeling that lingers after a visit to the zoo, after pondering the creatures on display. Something has stuck to us that we can’t easily wash off. A mixture of lingering animal scents? A discomfort with our own unrelenting curiosity? For me, the poem’s real question is this: Is it enough to have asked “Is this enough”? I’m aware, thoughtful, concerned; I’ve made note. Have I done my duty? Is it now OK to stare? 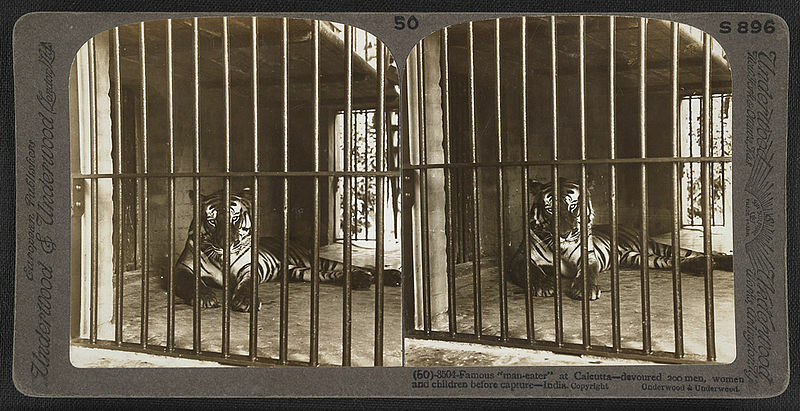 Certain images and situations recur in poets’ encounters with zoos. The Jardin des Plantes is visited in Penned by John Wain and Daryl Hine, and, in her own collection, by Bolster herself. 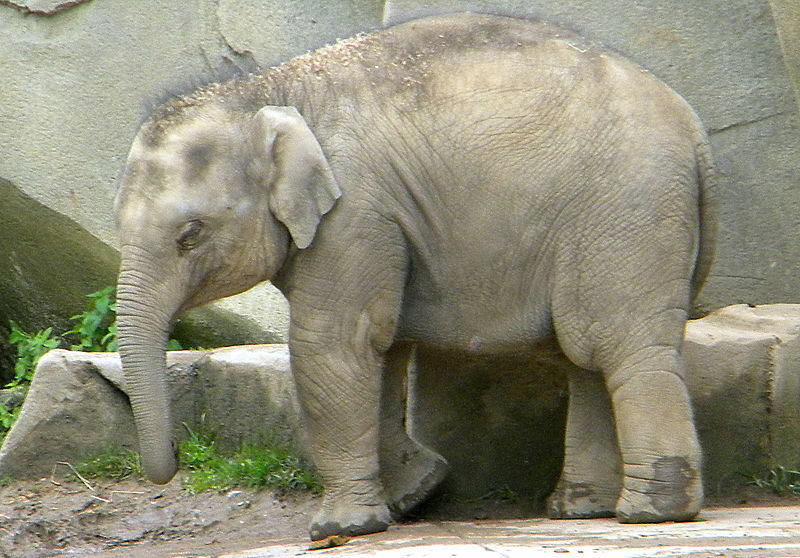 Elephants are unavoidable, in winter and otherwise. Likewise tigers and gorillas, and, of course, the zoo keeper, who is watched as keenly as the animals he tends, and perhaps less apologetically. In A.F. Mortiz’s “Zoo Keeper,” we see him lugging meat and slipping “through urine and water . . . a gravy/ of various sewage”. In Linda Paston’s “The Keeper,” the bearded God in Tintoretto’s painting Creation of the Animals, his “arms bent/ like the wings of the white swan,” is wonderfully, unexpectedly transformed into the keeper at the Bronx Zoo, “who sat among the elephants/ in his gray and crumpled uniform, trumpeting/ with laughter, feeding/ them bits of his own lunch”. Bolster’s keepers, who maintain their duties “When We Stop Visiting”, who “stirred/ the tanks in Budapest/ during the siege, to stop/ the sharks from freezing”, usher us into another recurring element of zoo poetry: the zoo during wartime. The fate of the animals in a zoo in a city under siege feels especially tragic, for they were never meant to be there: that was our own doing. Not only have we corralled them, we’ve put them in the path of an unseemly danger. Poem after poem in Penned addresses some zoo-related wartime footnote; the bear that was reportedly the last animal at the Sarajevo Zoo appears in poems by both Walter Pavich and Glyn Maxwell. Maxwell writes, “The hands of children here were wringing themselves/ hot with the plight of the animals over there”. Susan Howe writes of a visit to the zoo in Delaware Park the day Pearl Harbour was attacked, and Alison Calder writes rivetingly of an elephant in the Berlin Zoo on which a bomb dropped during WWII, “the logic of his death no stranger/ than his transplanted life beside the statues”. This does not seem a pleasant place to end. But it does leave us with a fact worth pondering: we could do far worse than “keeping” animals in cages and in our homes, and unforgivably, we have. As the late Gwendolyn MacEwen wrote in her poem “Invocations,” which appears in Penned, “In this zoo there are beasts which/ like some truths, are far too true”.